Bosch distributors for Porsche 356, 912 (1.6L) and early 911 (2.0 to 2.7L). Distributors are rebuilt to factory performance or timing advance can be modified for better engine matching and/or performance. See the Prices page for details. A typical advance curve and distributor data can be found here. Don't want to have your car off the road while you're waiting to have your distributor rebuilt? We'll send you a loaner! 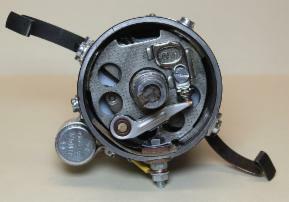 The centrifugal advance distributors used for Porsche 1600 engines (356/912) were designed with similar advanced curves. Early cast iron BRS 383 and BR 9 distributors were used on Porsches up to 1957, with a mechanical advance similar to the later BR18, 022, and 031 models. All distributors after 1957 for 1600 engines (356 and 912) shared similar advance characteristics. 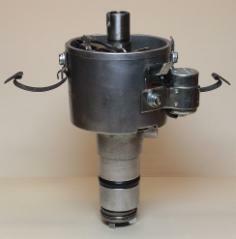 The BR18 distributor is part of the series of mechanical distributors used by Porsche starting in late 1957 for 356A models. 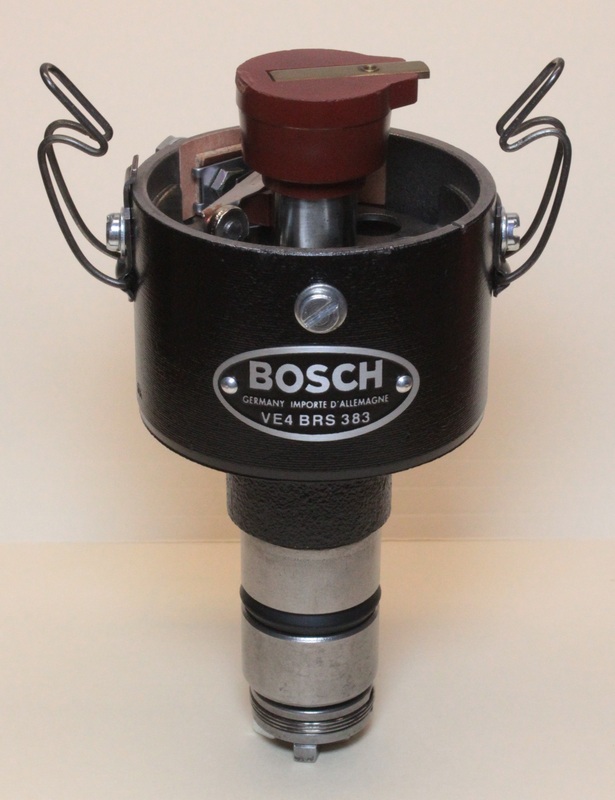 It has a cast iron body with the main shaft through the bore at its base (unlike the later 022 that used bushings). 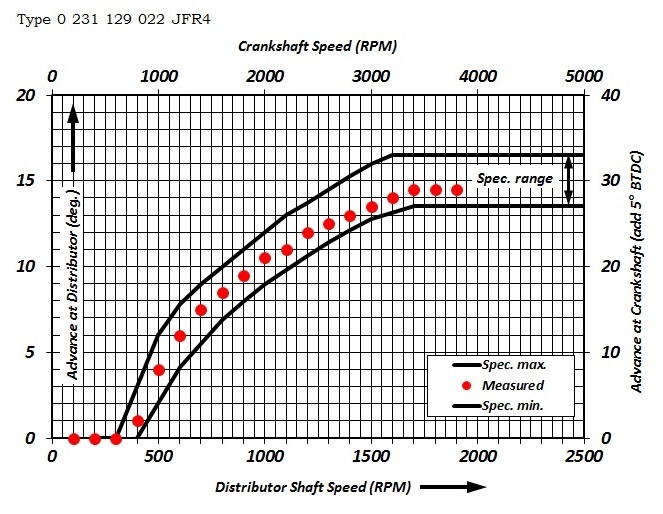 Maximum mechanical advance is 30° +/-3° at the crankshaft starting at about 3000 RPM, not including an initial static 5°. A compatible distributor cap is part #616.602.215.00, the rotor is #616.602.221.00, the points are #616.602.226.01, and the original Bosch condenser is #1 237 330 045 (or new #616.602.907.02). 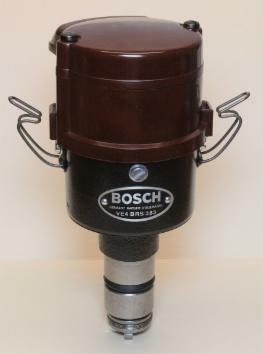 Early original Bosch condensers used a yellow wire, later originals used a black wire. The terminal insulator on the BR18 is round fiber. The factory condenser capacitance range is 0.27-0.32 MFD, the contact gap is 0.4-0.5mm for 47-53° dwell, and the breaker spring tension spec. is 400-500g. 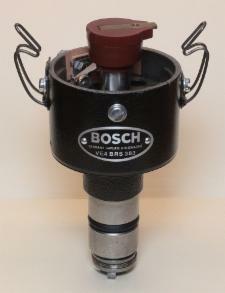 The cast iron Bosch 383 distributor together with the BR9 were the first that were used in the Porsche 356. The advance of these older distributors is a bit lower than later models, with slight less roll-off above idle at higher revs. 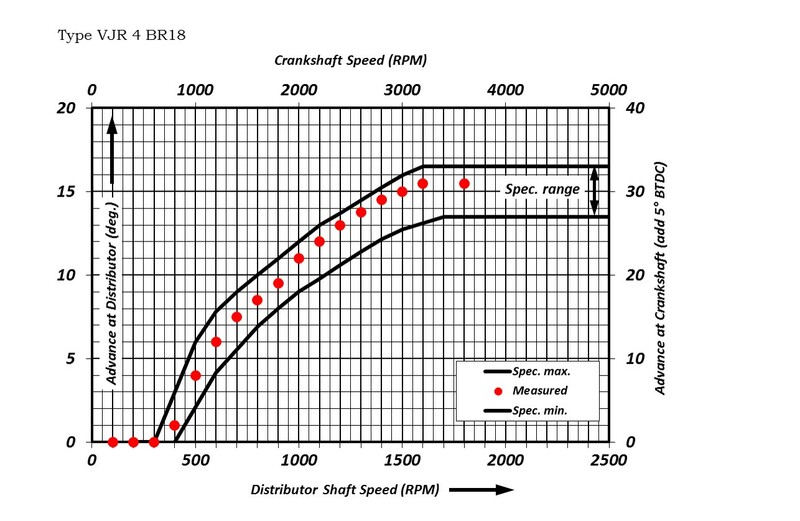 Differences between their advance curves and the BR18 are within the spec. limits of both so little performance difference will be noticed. 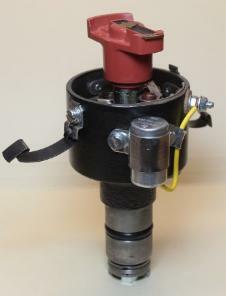 The 383 used a flat top distributor cap, which is no longer available. Searching might turn one up, but at a premium. Rotors are nearly as rare. Cap clips were either the wire type or parkerized steel, as the later model clips. The BR9 uses the later style cap. 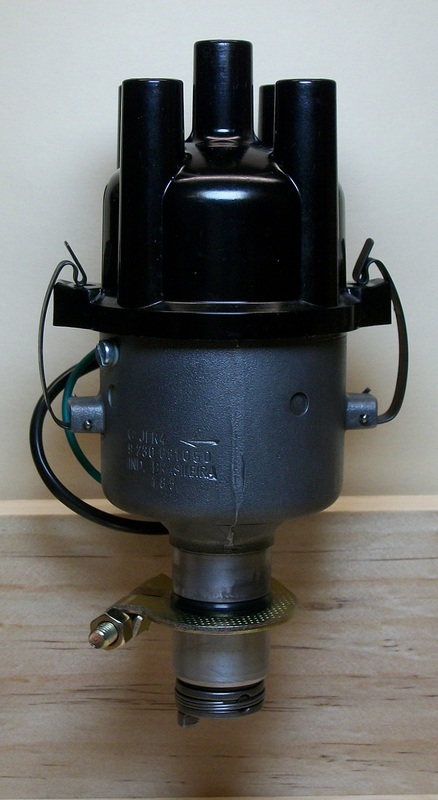 CFI rebuilds and restores 383 and BR9 distributors, including the flat top cap and rotor. Alternatively, we sell re-tagged 383 distributors which start as Bosch 022s with a new Bosch 383 tag and with proper 383 type insulator and terminal connectors. These re-tagged 383s come with a later style cap. This is a good alternative and nearly concourse for pre-A 356 models and 1956-1957 356As. Optimum performance of a 356A or pre-A is assured with this option, which allows for replacing the rotor and cap with tune-ups. The performance of the 022 distributor is identical to the BR18. 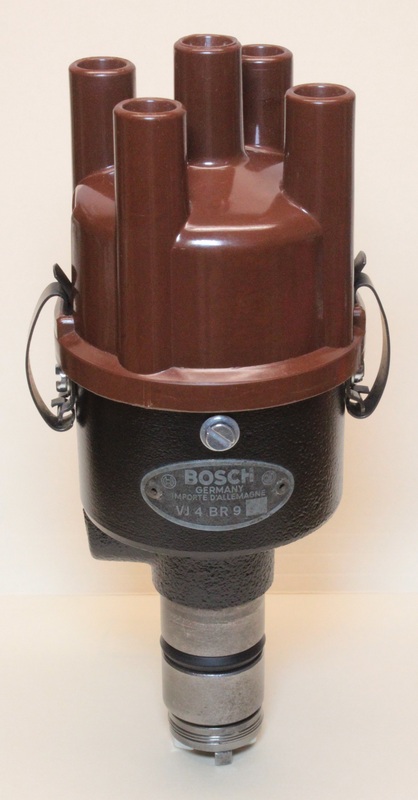 It also has a cast iron body but the main shaft runs through bushings at the base. A felt wicking pad resides between bushings to retain oil. The terminal insulator is plastic and formed to accept a spade terminal. 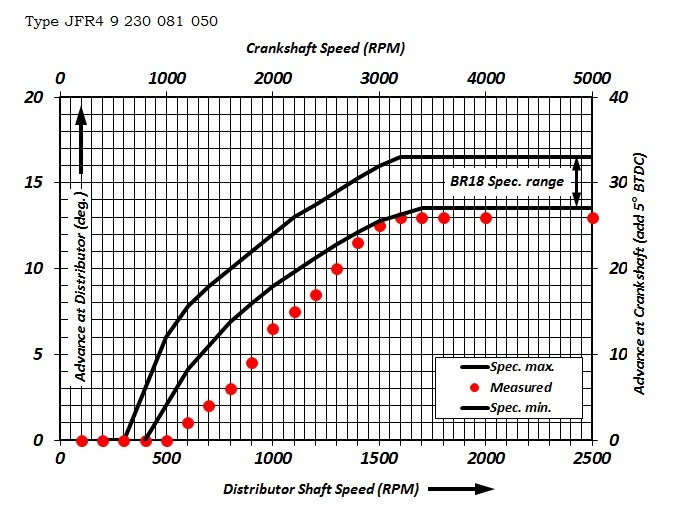 Like the BR18, maximum mechanical advance is 30° +/-3° at the crankshaft starting at about 3000 RPM, not including an initial 5°. A compatible distributor cap is part# 616.602.215.00, the rotor is # 616.602.221.00, the points are # 616.602.226.01, and the original Bosch condenser is # 1 237 330 045 (or new #616.602.907.02). Early original Bosch condensers used a yellow wire, later originals used a black wire. The factory condenser capacitance range is 0.27-0.32 MFD, the contact gap is 0.4-0.5mm for 47-53° dwell, and the breaker spring tension spec. is 400-500g. The Bosch 031 is an aluminum body distributor supplied by Bosch after production of the 356. 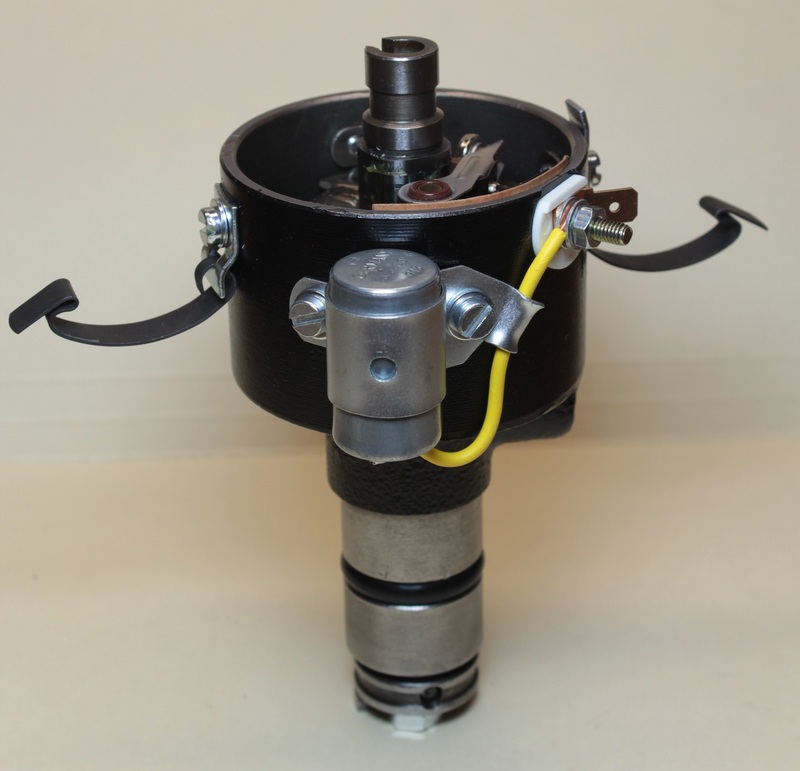 It has similar internal construction to the BR18 and 022 distributors and was used in 912s for non-US delivery in late 1967 through 1969, and for replacement distributors after that. 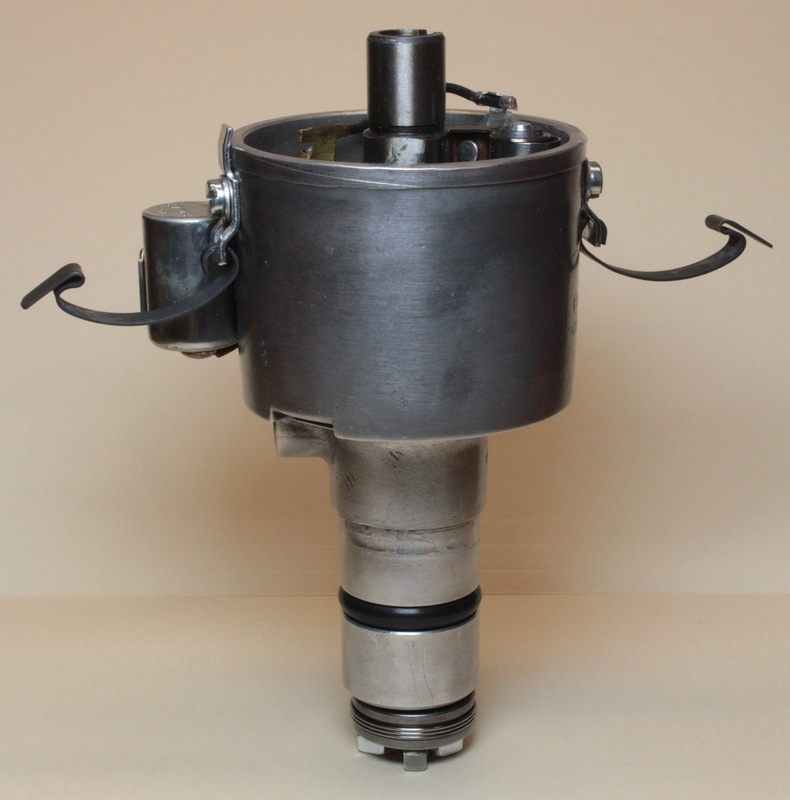 Modifications of the 031 to retard timing at reduced engine load via vacuum control resulted in the 061 distributor for 1968 and 1969 US delivered 912s. 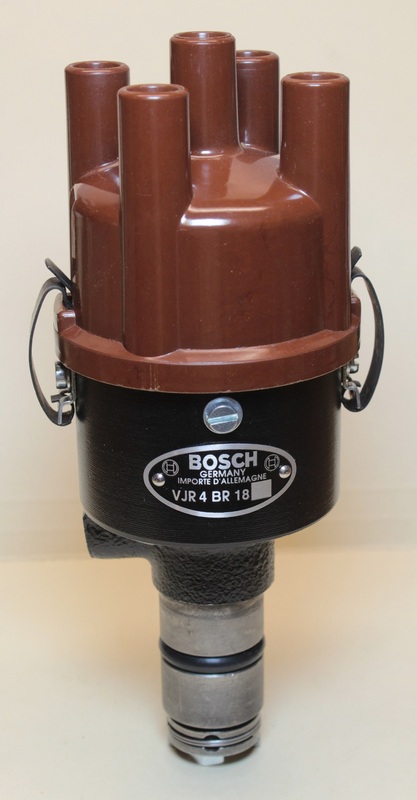 This additional vacuum control was to help reduce emissions. A compatible distributor cap for the 031 distributor is part# 616.602.215.3, the rotor is # 616.602.221.05, the points are # 616.602.226.02, and the condenser is # 1.237.330.115 or 140. CFI can provide rebuilding service for 031 and 061 distributors as allowed by their condition. Aluminum body distributors can be rebuilt using similar parts as cast iron. CFI rebuilds aluminum body distributors with new hardware, shims, thrust washers, insulators, sliding plates, springs, and other components as needed. 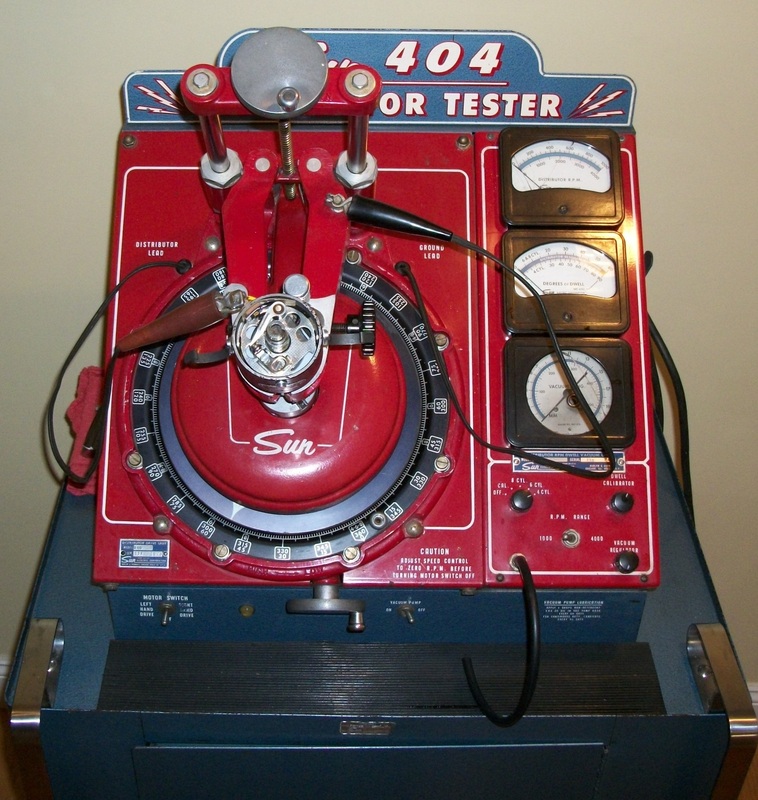 Each is adjusted and tested on a Sun 404 distributor testing machine. The 050 distributor has been used as the closest Bosch replacement for original distributors. As seen from its advance curve, the total advance is about 13° at the distributor and 26° at the crankshaft. This is just below the factory spec of 27° but better suited for today's lower octane gas (91-93 premium). The 050 wasn't designed for the Porsche 1600 motor and so lacks some advance in the midrange. It provides a mostly straight line increase from idle without the same roll-off toward maximum as the BR18/022. The ~5° lower advance can be offset to some extent by increasing the initial timing a few degrees, leading to improved performance with a maximum still within factory limits. The 050 is a viable option for use in a Porsche 356/912 and is also an excellent choice as a spare. A compatible distributor cap is part# 231.081.413, the rotor is # 231.081.628, the points are # 1.237.013.044, and the condenser is # 9.231.081.465 (and others). The 050 distributor is 90° offset from the original BR18/022 where plug #4 is placed at the normal #1 position. This should be taken into account and instructions are provided by CFI for proper installation. 1. Crank engine to TDC on #1 Cylinder. Pop off cap. 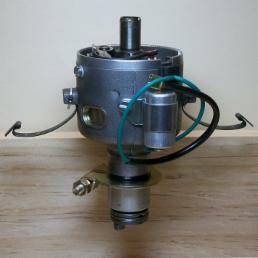 Confirm by looking at rotor, which should be at 5 o'clock position and pointing to 1 Cylinder (Right Front). 2. 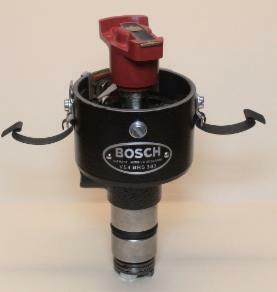 Loosen clamp. Disconnect distributor wire at coil. Remove original distributor. Preserve. 3. 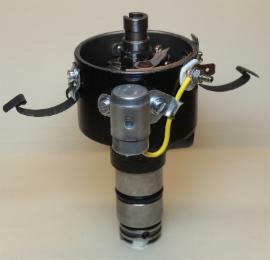 Is Chord Cut-Out of distributor drive perpendicular to axis of car, and narrower part pointing towards the REAR of the car (the muffler)? If so, Good. 4. Install seal on 050's shaft. Lube with oil/WD-40. Install .050. Rotor should point to 7 o'clock position, and you should feel the "klunk" when it slips in to the drive gear. Rotate 050's body until the notch in distributor body is underneath notch on rotor. 5. With OT Timing mark notch on crank pulley 1/4" to the LEFT of the timing mark on the Third Piece, (that's about 5 degrees) rotate 050 until points jusssst begin to open. 6. Snug down clamp bolt. 7. Hook up wires in cap, knowing that the firing order is 1-4-3-2 and you're at #1. 8. Hook up wires to coil. Fire up and adjust high speed timing at 33 degrees. Idle should be at 5-6 degrees. The pre-gapped points are at .016-.018". 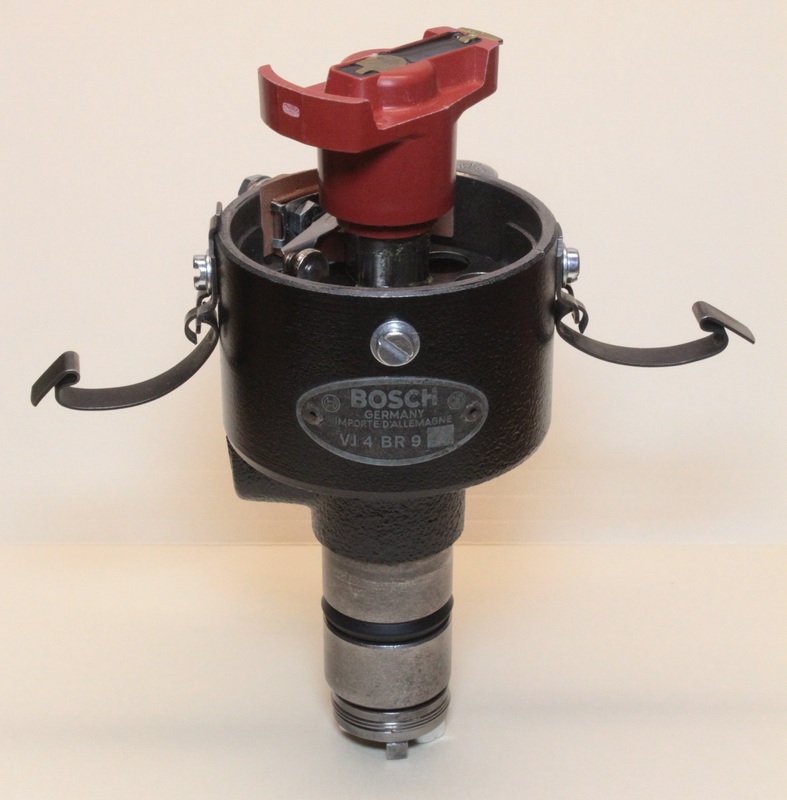 CFI rebuilds Bosch distributor parts using Bosch OEM replacement parts to achieve like-new appearance and function. Changes to the advance curve can also be made through modifications to the advance stop and springs (see details in the testing page). 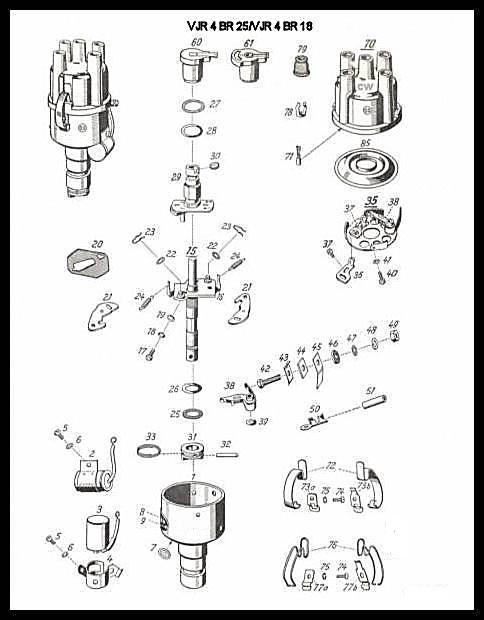 Standard Bosch replacement parts include those below, which correspond to parts in the diagram below but are common across most Bosch distributors. All hardware is cleaned and plated or replaced as needed. Cast iron bodies are cleaned, acid-etch primed, and painted to match factory finish. The ID tag (9) is replaced if needed and available. Internal fiber thrust washers (26, 28) are replaced with OEM or Delrin washers to spec. Slider plates (20) are replaced with new to spec. Friction and contact areas are inspected and polished. Bushings are inspected and replaced if needed. All moving parts are confirmed to operate as new. Breaker plates (35) are cleaned and nickel plated as needed. Advance springs (24) are replaced with new if needed to achieve proper advance curve, as tested on a Sun 404 distributor testing machine. Functional tests include electrical resistance, breaker point tension, cam lobe accuracy, breaker alignment, point dwell and variation, centrifugal advance calibration, and vacuum advance/retard (when applicable). Condenser (3) is tested and rewired or replaced. Condenser bracket (4) is replated or replaced as needed. Shaft (15) play is tested and end play is adjusted to <0.1mm as per spec. Points, rotor, and cap are replaced. 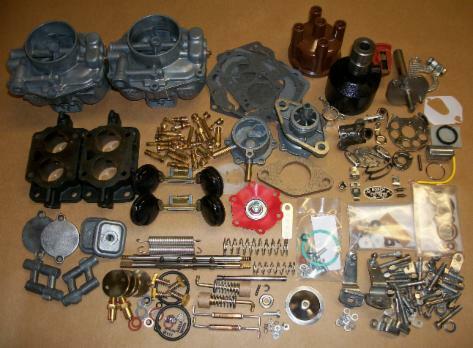 Array of restored and rebuild parts for Zenith 32NDIX carburetors, a Pierburg fuel pump, and a Bosch 022 distributor for a 1964 Porsche 356C, ready for assembly and test. 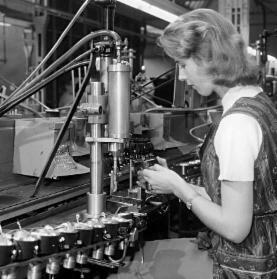 During the 50's and 60's, the manufacture and assembly of Bosch distributors was carried out in Stuttgart and nearby European plants. 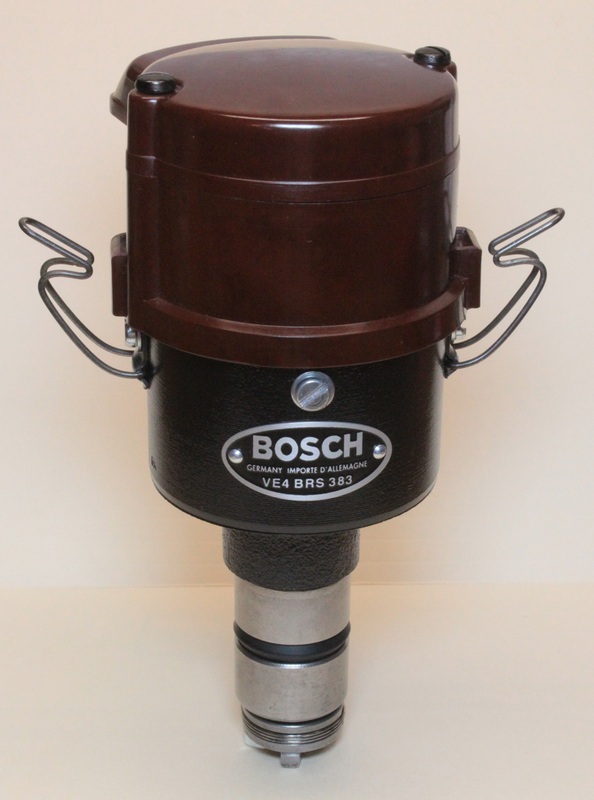 In the late 50's, Bosch built a factory in Brazil to supply components for its large South American market.